As the researchers reveal in the new study, they used a novel configuration method in which an individual graphene nanoribbon bridges two metallic electrodes, forming an electronic circuit. Using a microscope tip, the researchers partially lifted the nanoribbon so that it lay partly on the substrate and partly suspended. This configuration reduces the coupling between the nanoribbon and the electrodes that would otherwise quench the light emission. 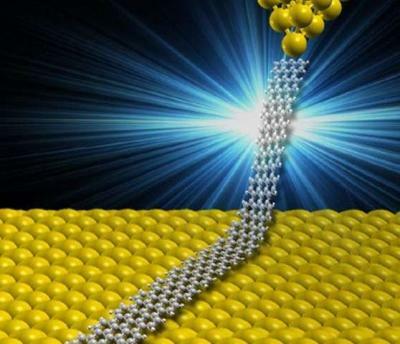 Tests showed that the individual graphene nanoribbons exhibit an intense optical emission of up to 10 million photons per second, which is 100 times more intense than the emission measured for previous single-molecular optoelectronic devices. "We likely will explore the influence of the width of the graphene nanoribbons on the color of the emitted light, as the width is expected to control the size of the gap," the researchers said. "The impact of defects should also be explored. Eventually, one should propose methods to integrate our graphene nanoribbons devices in larger circuitry."